Whether it’s misleading marketing tactics or just popular assumption, most foods available to us fall into one of two categories: healthy or unhealthy. Here are five food items that have found their way into the “healthy” category that shouldn’t be there. Yes, it has vitamins but many times it also has tons of artificial flavors and sugar. Don’t let the marketing of these products fool you. The majority if these products are simply glorified sodas. Make your own flavored water from home by squeezing a hint of lemon, orange, or other fruit juice in your water. It will save you money and will be easier on the waistline. While most don’t consider this a “healthy” beverage many do consider this drink a lesser of two evils when compared to regular pop. I’ve heard it so many times, “get a diet pop, it’s better for you.” But is it really? Last time I checked carbonated water, artificial sweeteners, caffeine, and food coloring weren’t too good for anyone, whether it’s diet or regular. Have a glass of 100% fruit juice with no added sugar. Yes, fruit drinks are high in calories due to the sugars naturally found in fruit but at least you can count this towards your daily fruit total and you’ll be getting the vitamins you wouldn’t find in soda. This one can be tricky and there are several varieties out there that really are nutritious snacks, how ever, many of them are just as high in saturated fat, hydrogenated oils, and calories as some candy bars. My advice would be to check the nutrition label. 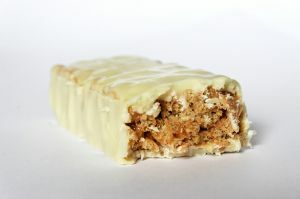 Make your own nutrition bar. Contrary to what many think, it can be quick and easy too. Here’s one recipe I found in a matter of minutes online and have used myself. Just because a product is “fat free” does not mean it’s healthy. To make up for lost flavor due to the reduction in fat many dressings have added sugar…and lots of it. This results in a dressing that is loaded with calories. In addition, when paired with a salad this is one instance where some fat is a plus. A little fat can help absorb the fat soluble vitamins A, D, E, and K found in the salad greens. Stick to an oil based dressing but look for ingredients like vinegar, herbs or olive oil, which is rich in healthier monounsaturated fat. A better alternative to regular potato chips? Yes. A “healthy” food? No. 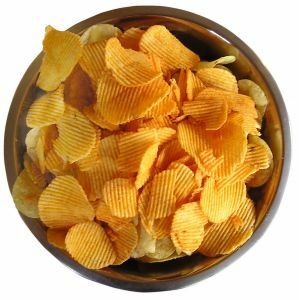 Although they are typically lower in fat and calories, baked potato chips still can be high in sodium and offer little else in the way of nutrition. Have some popcorn, but be health conscious in its preparation. If it’s drenched in salt and butter it will mostly override any health benefits you may have gained. Instead, air pop it and add some garlic or low fat parmesan cheese. This way you can enjoy a tasty snack that is naturally high in fiber and antioxidants. Get in the habit of checking the nutrition facts label on all your grocery items, including the drinks you purchase. This way you can compare products to separate the foods that truly belong in the “healthy” category from those that don’t.